World-renown MTV News and RapFix host Sway Calloway released his new t-shirts today with a simple message: “I GOT THE ANSWERS,” in response to Kanye West’s recent rant during an interview on Sway’s show “Sway In the Morning” on SiriusXM station Shade 45. The infamous superstar repeatedly screamed “How, Sway? You ain’t got the answers man!” after Sway asked about Kanye’s new Nike Red October shoes during the interview on Tuesday, Nov. 26th in the New York studio. The well-respected Hip-Hop expert and longtime music industry personality addressed his much-talked about interview with Mr. West for the first time on MTV’s RapFix live show today. Not one to shy away from controversy, his new t-shirts unveil exactly how he feels about the entire ordeal. 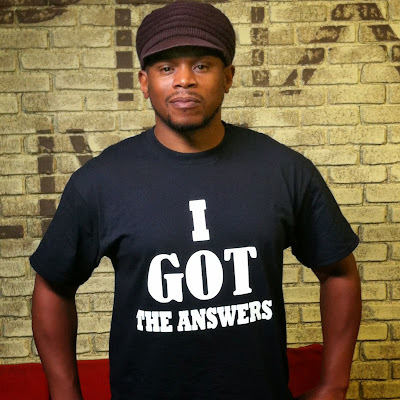 Sway’s “I Got the Answers” t-shirts are available for purchase at www.swaysuniverse.com.